Paul, seen here taking a little lunch break yesterday, told us wonderful stories of his time at Entebbe, where he represented his school in Athletics. Whilst there he taught himself to ride a bicycle, falling off only once, which hurt so much he determined not to have it happen again. Taking a ride outside the campus (every mother’s nightmare) he saw his first ever traffic lights and persuaded a policeman to hold the traffic as he was late for an event!! If we can capture these stories onto YouTube so you can see him signing, we will. Sam interpreted for us, and we felt totally disabled. We travel to Buckley High tomorrow so Paul can say thank you and farewell to his teachers and friends. 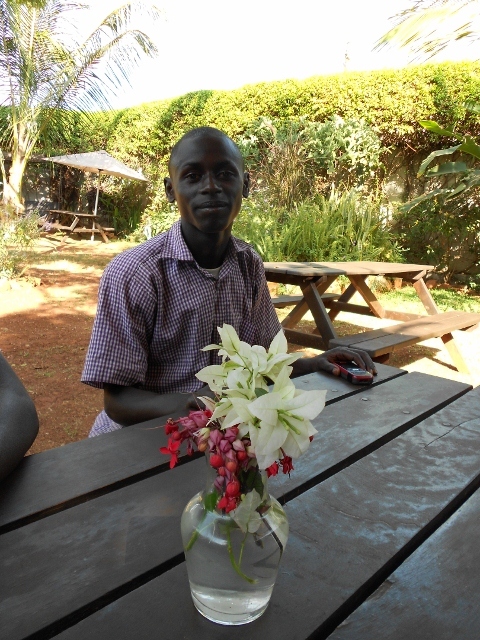 Next week he will register for Senior Vocational where he will continue his skills to become the best carpenter ever. Paul is the most wonderful young man.